When other members of staff relay behaviour awards, detentions and intelligence events onto you, you will receive a notification which is added to your notifications centre. To access the notifications centre, click on the bell icon in the top right hand corner of the page. You will be presented with a list of activities that you have been informed about. If you have received notifications which you haven't opened yet, you will see a banner at the top of the page that allows you to view them. Click on the orange arrow to open up the notification in further detail. Clicking on the arrow again will hide the notification details. Click on the bin icon to delete the notification. You will be asked to confirm your choice. Tick the checkbox to select the notification. 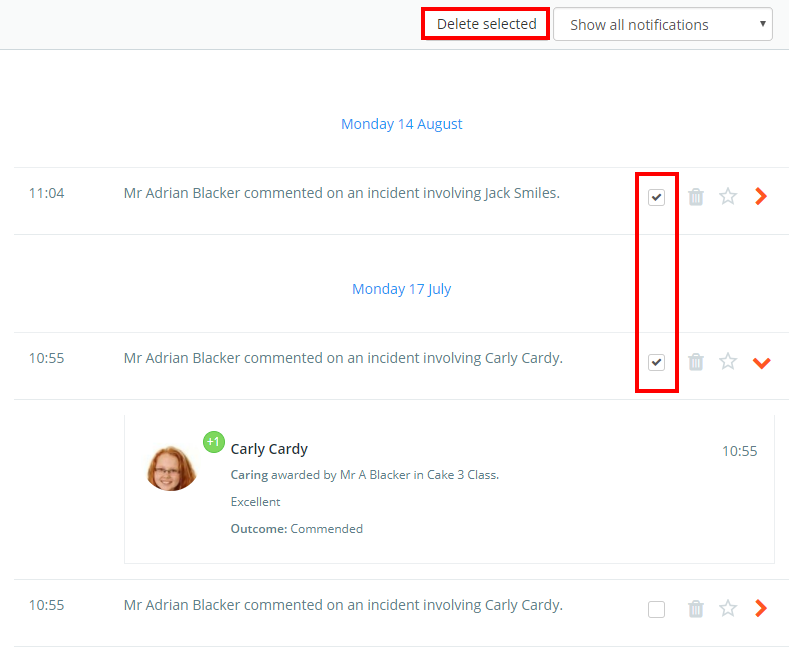 Selected notifications can then be deleted in bulk with the Delete selected button at the top of the page. To search the notifications list, enter a search term into the search bar in the top right hand corner of the page. The notifications list can also be filtered from the Show all notifications drop down menu in the top right hand corner of the page.